Disaster relief is a lot about small moments. 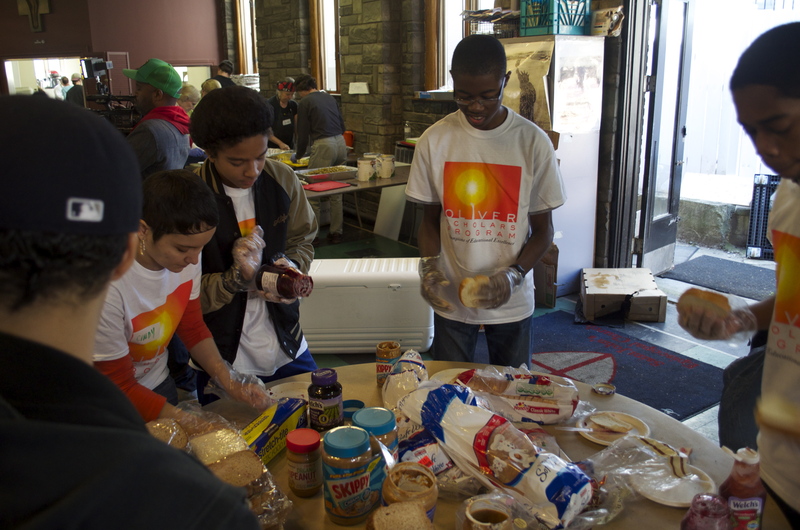 I have a few I want to share with you today – on Thanksgiving – how the Sahana Software Foundation is helping to feed thousands of persons in the communities hardest hit by the impact of Hurricane Sandy. 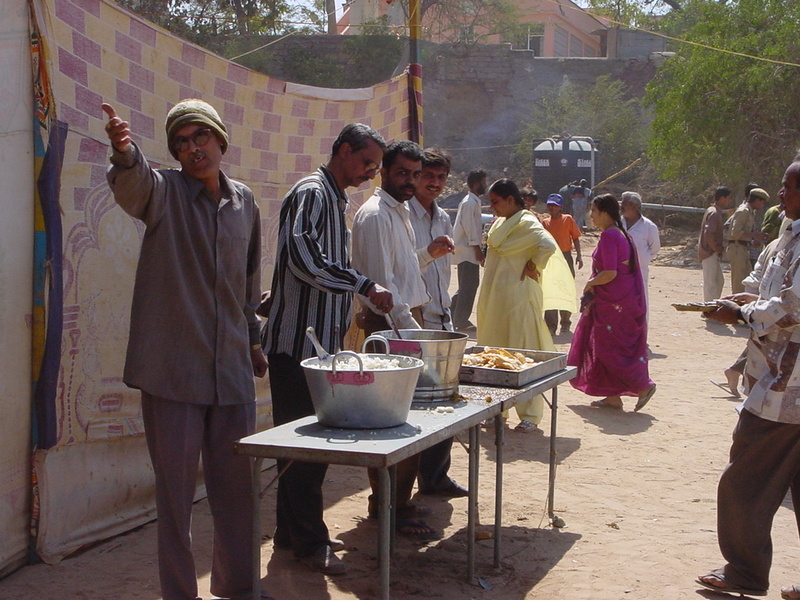 Having been involved in disaster relief for over 20 years now, I am used to seeing lines of people waiting for meals to be served to them in tents, in churches, or out in the open. I’ve had many meals myself at places like this one in Gujurat, India after a large earthquake there in 2001. A friend and neighbor of mine Sara started organizing the collection of donations of hot food from our neighborhood that could be delivered in communities affected by Hurricane Sandy, working with local restaurant Two Boots and the Old First Reformed Church in Park Slope to reheat and deliver the food. My wife Maria wanted to contribute to the relief efforts in some way and starting making tray after tray of lasagne, dropping it off at Two Boots and the Church. I must admit, however, to being a bit skeptical about the value given the amount of effort I saw going into the collection of hot meals for transportation to the Rockaways, Coney Island, and Staten Island. 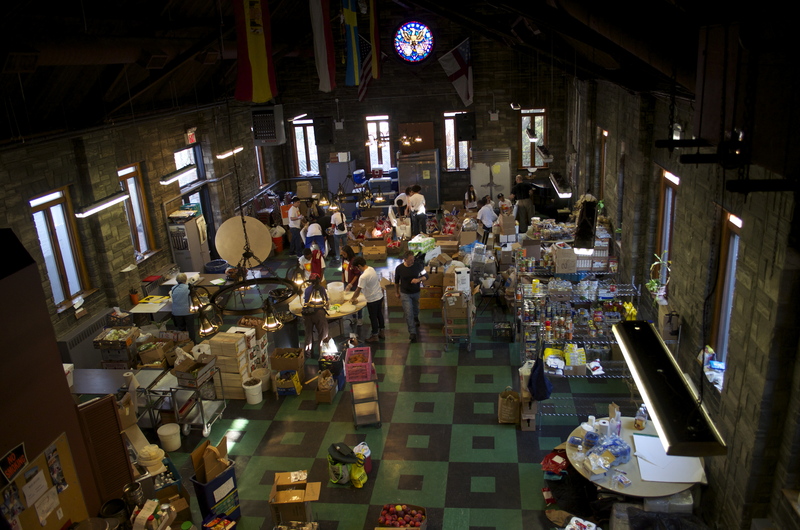 Then I took my first visit to the Rockaways two weeks ago and spoke with the volunteers at the YANA (for “You Are Not Alone”) Relief Center organized and run by Occupy Sandy at Beach 113th Street and Rockaway Beach Boulevard. I arrived after dark and at the end of a long and hard day for the community there. They had not received their usual delivery of a hot lunch that day; and dinner had just arrived, over an hour later than normal. Despite making numerous phone calls to multiple sources requesting hot meals to be delivered that day, and promises made to deliver, no one was letting them know when they were en route. As darkness fell and food had still not arrived, the level of stress rose and people were…. upset. When the food arrived, a huge wave of smiles broke out amongst both the community and volunteers. When I got home that night, I told Maria to keep making lasagnes. 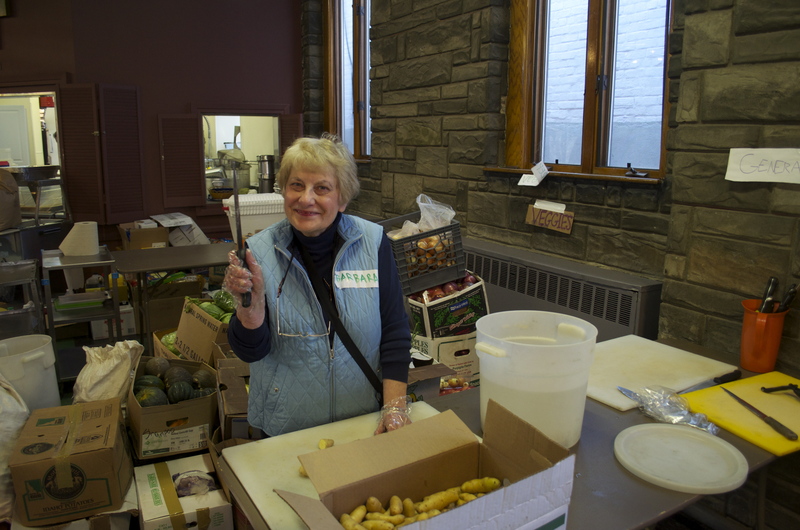 A couple of days ago, we decided to focus our Sahana Eden efforts around the coordination of meals for Occupy Sandy. 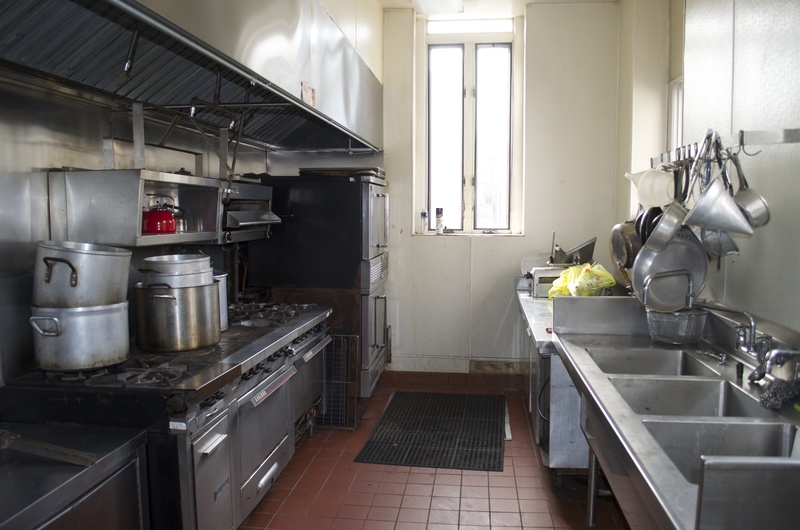 They were consolidating their kitchen operations in a new facility at the St. Johns Episcopal Church on 99th St. in Bay Ridge It has a fabulously large kitchen, lots of space to set up prep, production of cold meals (usually sandwiches and snacks), and is at least 20 minutes closer to most of the sites receiving meals from Occupy Sandy. The chance to work with a new mission critical site provided the perfect opportunity to transition those taking and fulfilling orders for meals onto the Sahana Eden, and provided the perfect laboratory to oversee the stress testing of the Sahana Sandy Relief site. It would also give us the confidence to roll out the use of the Sahana site for the fulfillment of requests for other relief items. 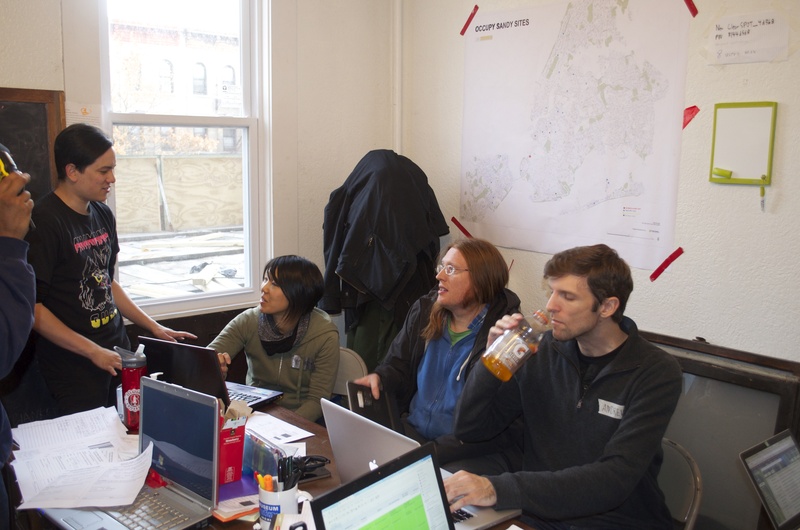 Fran worked with and trained their “comms” people – who coordinate communications between different relief sites – such that they would be ready to use Sahana to manage their meals deliveries, and tweaking Eden’s features to best match the needs here. The new facility went operational on Tuesday. For the next two days, they went through the normal and to be expected challenges and pains of setting up a new site. 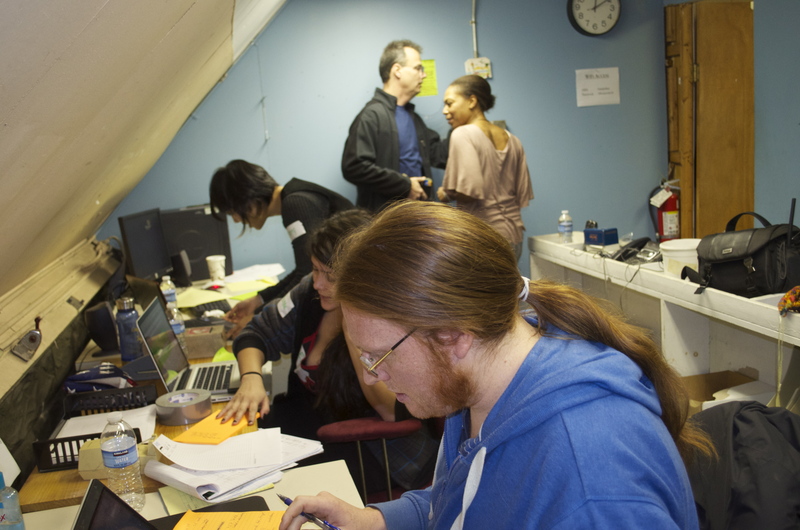 Mixing a bit of chaos, two cups of confusion, a quart of poor communications, one failed access point router, 1/2 pound of indecipherable contact lists, and 15 volunteers less than needed to make and prepare food. Still, the recipe came together, food got prepared and delivered. Truth be told, Sahana was not used much… but we learned a lot about how to make their processes work more effectively. And we helped get their new site operations organized, which was incredibly valuable. On Wednesday, I accompanied Fran to the Bay Ridge site and brought my mother along, who is visiting for the Thanksgiving Holiday from the Boston area. Mom was put to work doing prep for the kitchen, diving in with knife and cutting board and an endless pile of potatoes to chop. I spent the morning helping out wherever I was needed. This included getting Chef Norman to slow down long enough to dictate a shopping list of items he needed purchased in order to complete the dishes being prepared (lemons, cranberries and bunches of mint). Getting quantities out of him was a challenge. How many cranberries do you need Chef? What’s “a lot”? 10 bags of cranberries, 50, 100? I found a volunteer driver to make a shopping run and sent him on his way. I showed a group of volunteer students from a local youth group how to use a manual can opener so they could open dozens of cans of Yams. They had never used one before. Fran dove right it to help manage comms and dispatch for the site, setting them up with a new google voice number and gmail account, trying to sort and navigate through all of the orders that had been entered using their legacy spreadsheets. The first couple of hours were challenging but it started to come together when it approached time to send out the first hot meals of the day. 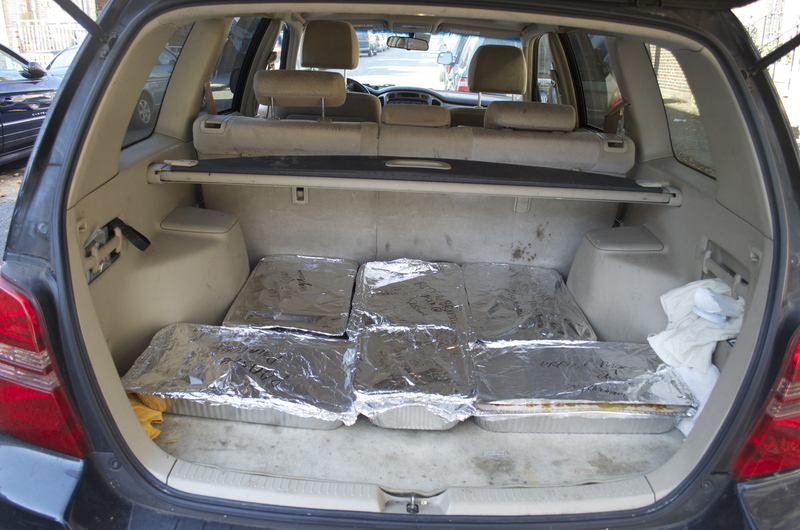 I set out for the YANA relief center on Far Rockaway with 200 hot meals packed into the back of my car. I had three trays of curry macaroni and cheese, one of beef with broccoli, a large tray of roasted potatoes and two small trays of rice. Plus three bags of bananas in the back seat…. all that Bay Ridge could spare. Rockaway Park is fond of bananas and they have made it part of their standing order. Arriving at the YANA site, I can’t tell you the gratitude I received from the volunteers for bringing them the hot meals. There are two women there who have been doing this every day for two weeks; serving and handing out whatever food they have to whoever wants it. I was hugged. Twice. I confirmed their standing order – 200 meals + bananas – lunch and dinner – every day until they tell us to stop. I gave them a contact card my mother had made up with the telephone number and e-mail address of the Bay Ridge kitchen and then confirmed with Fran by phone the repeating order after leaving so he would get it into Sahana, eliminating the need for them to have to call again tomorrow. As we were getting ready to leave, my mother asked where all the people were? There were only two gentleman who had shown up when I was unloading, asking if we had food and then patiently waiting while we set up the serving trays and put a plate together for each of them. I told her that they would be coming. 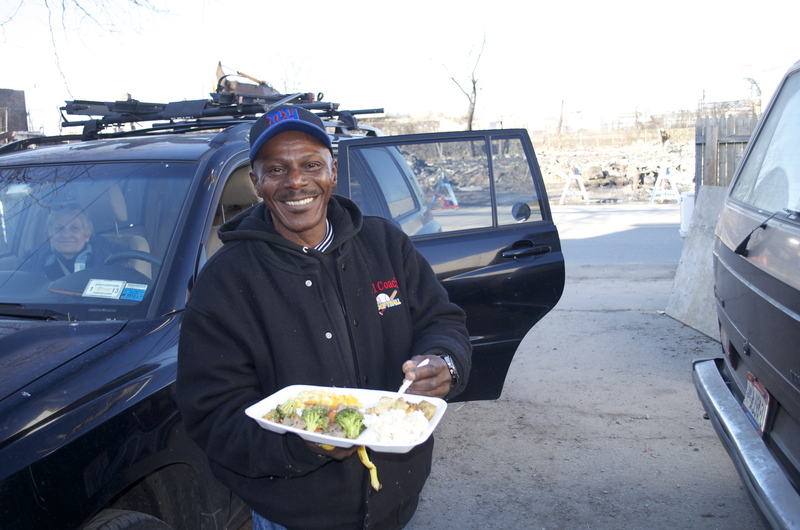 The two had each left with a hot plate of food, walking back towards downtown Rockaway Park, only a few blocks away. People would know that lunch was being served. Sure enough, as we pulled out, there was a solid line of people approaching the site from all directions. I felt good. Having just put a 23-pound turkey in the oven to feed 20 friends and relations coming to my house for dinner later this afternoon, I am now off with my children to pick up a load a Thanksgiving meals from Bay Ridge to bring to Coney Island. I fear their conception of disaster relief is their father sitting in front of a computer day and night for weeks at a time, or is just not home, despite what I tell them and try to show them about what I do. This is a unique and special opportunity for them to participate in helping a community and a place that they care about and for me to share in a very personal way what I do with my family and my community. We should be back before the turkey is ready, but somehow, I know that it will taste just as great today even if a little overdone.